(Bloomberg) -- While U.S. equity investors have kept their cool during this year’s escalation of trade tensions, the warnings from Wall Street are only getting louder. Goldman Sachs Group Inc. and JPMorgan Chase & Co. have weighed in, highlighting the potential danger to corporate America if a full-blown trade war erupts. In separate notes this week, strategists at the firms estimated the possible hit to earnings. Goldman chief strategist David Kostin went as far as to call for a bear market under a scenario where the U.S. imposed 10 percent tariffs on all imports. 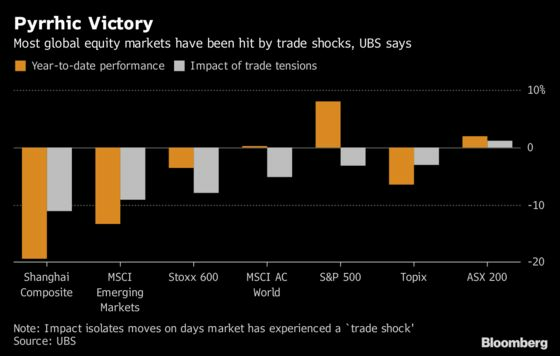 The concerns echo those of UBS Group AG strategist Keith Parker, who last week alerted investors that the standout resilience of U.S. stocks is under threat with President Donald Trump mulling a new round of levies against China. Amid the global retreat from monetary stimulus, Morgan Stanley has also soured on equities. “We’re not that bullish on equities anywhere globally at Morgan Stanley right now,” Jonathan Garner, chief strategist for Asia and emerging markets, said in Hong Kong Thursday. “The latest move that we made on the U.S. side was to recommend reducing positions in U.S. equities,” he said in an interview with Bloomberg Television. Morgan Stanley is instead recommending securitized products linked to Libor, “to take advantage of those higher short yields,” Garner said. While all the anxiety seems to be at odds with investor attitudes -- considering they’ve pushed the S&P 500 Index toward its best year since 2014 versus the rest of the world -- it coincides with growing unease among corporate executives. Trade associations are mobilizing to advocate a de-escalation in the trade war -- read about that here. After studying more than 7,000 earnings transcripts and conference calls, JPMorgan found that trade tariffs surpassed tax cuts as a more frequent topic during the last reporting season, with 35 percent of companies citing them as a threat. The firm’s strategists led by Dubravko Lakos-Bujas estimate that the combined per-share earnings for S&P 500 companies could drop by as much as $10 if bi-lateral tariffs of 25 percent are imposed. This year’s earnings forecast for the benchmark is $165 per share. “Trade escalation could be a significant drag on forward EPS, especially next year,” Lakos-Bujas wrote. Goldman’s Kostin painted a more dire picture. A 25 percent tariff on Chinese goods could wipe out growth for S&P 500 companies next year. And in a more extreme case, where the U.S. imposed levies on all global imports, earnings could drop 10 percent as costs went up for Americans, the firm estimated. Investor sentiment could also suffer, driving down valuations. As a result, the worst-case scenario could result in the S&P 500 falling to 2,230, Kostin wrote in a note earlier this week. That would represent a 23 percent decline from the record 2,914 reached last month, meeting the traditional definition of a bear market. The S&P 500 briefly rebounded Wednesday on news that the U.S. is proposing new round of trade talks with China in the near future. The benchmark gauge has climbed about 8 percent this year, compared with a 6 percent decline in the MSCI World ex-U.S. Index.